I think I'm on the cusp of breaking through one of my most impenetrable brick walls. Regular readers know that the hunt is on to identify the parents of my fifth great-grandfather Thomas Kirk. A flurry of recently discovered evidence is finally settling and beginning to coalesce around a person of interest. Although he was born in Virginia in 1778, the earliest recorded appearance of Thomas Kirk in the paper trail was an 1806 tax list for Licking County, Ohio. From that document until his death in 1846, he lived in Ohio. It was just a couple weeks ago that I finally discovered the first evidence of Thomas Kirk in Virginia. A collection of five personal property tax records spanning the years 1799 through 1803 enumerated Thomas in his soon-to-be wife's hometown: Brooke County, Virginia (now West Virginia). Also enumerated with Thomas in each of those five tax records was a John Kirk. Both men first appeared in Brooke County's tax records in 1799. Neither man was there in 1798. Did they travel to the area together? If yes, who was John and what relationship, if any, was he to Thomas? A week before I discovered the Virginia tax records, I shared a DNA case study investigating the possibility that Thomas' Licking County neighbor Mary (Kirk) Geiger was his sister. Although the distant generations under scrutiny made it difficult to say definitively, the small amounts of shared DNA between descendants of Thomas and Mary matched what one would expect to see if these two Kirks were siblings. Bottom line: the DNA case study determined that the genetic evidence supported the theory that Thomas and Mary were brother and sister. Who was sister Mary and what light could she shed on the Kirks' parentage? Born in 1774, Mary was just four years older than Thomas. 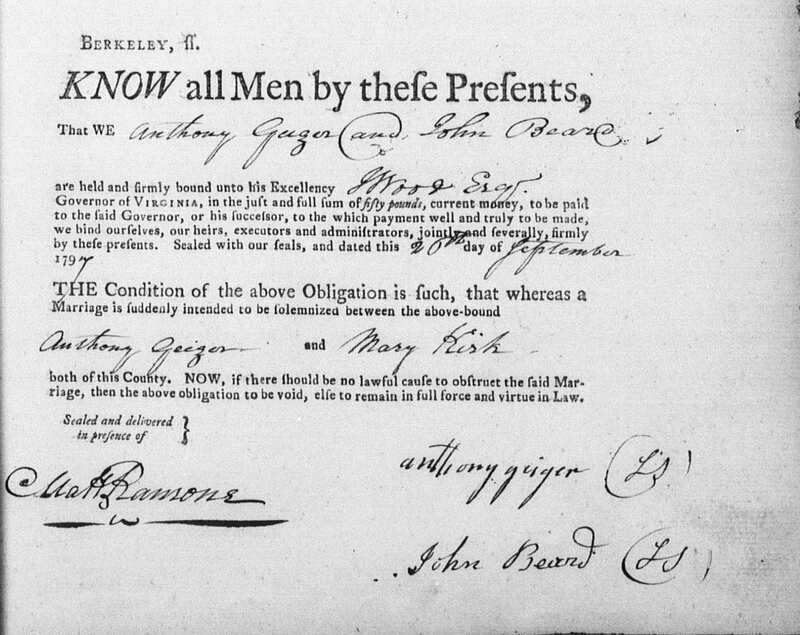 On September 26, 1797, a marriage bond in Berkeley County, Virginia (now West Virginia) recorded that a "marriage is suddenly intended to be solemnized between the above-bound Anthony Geiger and Mary Kirk." Even before the genetic link between Thomas and Mary was identified, the marriage bond was curious because of the surety, John Beard. Why was John Beard serving as the surety instead of the bride's father or a brother? What relationship was he to her? John Beard had lots of overlap with Thomas Kirk's history. He would later surface in Brooke County, Virginia, and eventually make his way to Licking County, Ohio where he sold Thomas 100 acres in 1812. Furthermore, published genealogies and a DAR application state that the maiden name of John's wife Margaret was Kirk. I've long speculated that, if Margaret was related to Thomas Kirk, she was most likely an aunt due to her age. Born in 1758, she was twenty years older than Thomas. Was John Beard serving as the surety on Mary Kirk's marriage bond because he was her uncle? Mary (Kirk) Geiger was clearly a person of interest, and her marriage in Berkeley County made the area prime investigative real estate. Given that a male Kirk did not serve as the surety for her marriage bond, I wondered if Mary's father had died before her 1797 nuptials requiring a maybe-uncle John Beard to fill the role. Beginning with that year and working backwards, I explored the surviving records now digitized on FamilySearch for any Kirks. First up were the land deeds, which date to 1772. On April 9, 1773, an indenture was made "between the Honourable George William Fairfax Esquire of the one part and Joseph Kirk of the County of Berkeley Farmer of the other part..." Joseph Kirk leased 100 acres that, in that year, was located in Norborne Parish in Berkeley County, (West) Virginia. 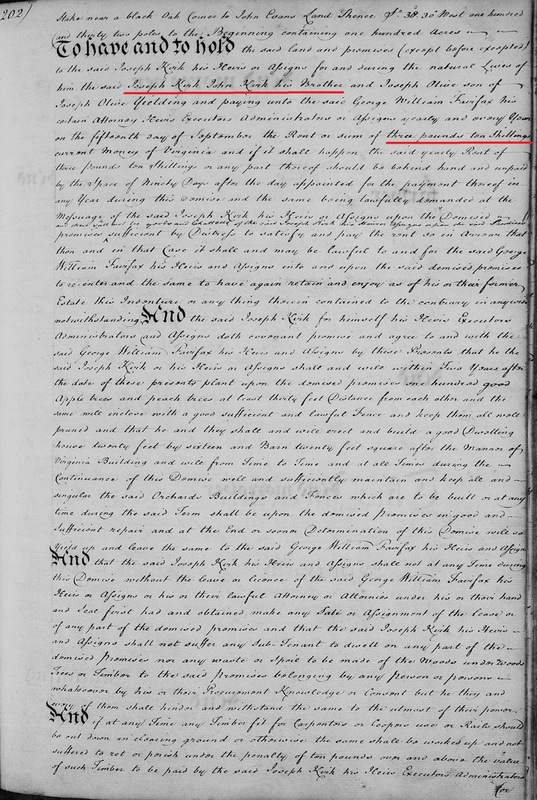 "To have and to hold the said land promises to the said Joseph Kirk his heirs or assigns for and during the natural lives of him the said Joseph Kirk, John Kirk his brother and Joseph Olive son of Joseph Olive yielding and paying unto the said George William Fairfax his certain attorney heirs executors administrators or assigns yearly and every year on the fifteenth day of September the rent or sum of three pounds ten shillings current money of Virginia..."
Failure to pay the rent would result in George William Fairfax having legal authority to occupy and regain full ownership and possession of the land. In her book Locating Your Roots: Discover Your Ancestors Using Land Records, Patricia Law Hatcher wrote that the lease for lives concept was widely used in the Northern Neck of Virginia. Hatcher explained that these agreements were "really a land grant, but its language is that of a lease. With a lease, technically the land still was the property of the proprietor (who was trying to retain his right to quitrents or taxes)." The record's identification of Joseph Kirk's brother John was a great genealogical gem. They were the only enumerated Kirks owning land in late 18th century Berkeley County. Land tax records, beginning in 1782 record Joseph paying tax on the 100 acres leased from Fairfax. Sometime between the 1787 and 1788 tax lists, Joseph Kirk died. The 1788 enumeration includes his name, but also the initials "Exrs". This peculiar abbreviation follows his name on the next nine years of land tax lists. In 1795, the abbreviation was spelled out: "Executors". 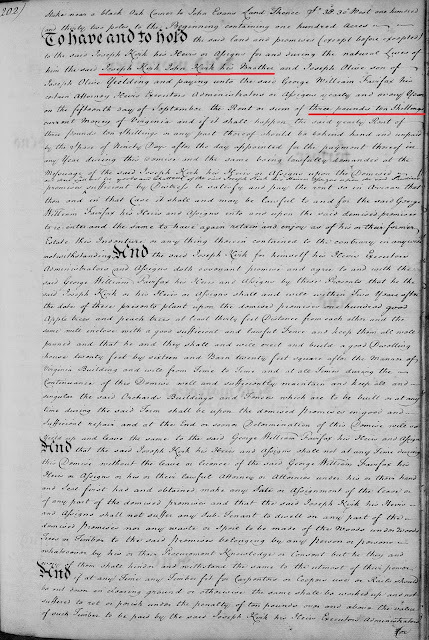 Was Joseph's name still appearing in land tax records because of the terms of the Lease for Lives, which, in the event of Joseph's death, assigned the lease to his brother John Kirk and Joseph Olive? Owning or leasing real estate in the 1700s seemed like a rarity. Perhaps more Kirks would show up in Berkeley County's personal property tax lists. Beginning in 1783, the tax lists enumerated just two Kirks: Joseph and John. In that year, Joseph paid tax on 3 horses and 4 cattle. John paid tax on 2 horses and 1 cattle. Both men appeared on the 1784 personal property tax list with the same amount of livestock. However, I couldn't find either man on the 1785 list. In 1786, only John Kirk appeared in what would be his last appearance on the tax list. He was enumerated with no livestock. Did the Kirks fall on hard times? Where was Joseph? Did he actually die earlier than the 1787-1788 range suggested by the land tax lists? Joseph's last appearance in the personal property tax list in 1784 expands the window of his death to 1784-1788. In the 1787 personal property tax list, a new Kirk emerges: Sarah Kirk. She continued to appear intermittently in the personal property tax lists for 1788, 1792, and each year 1794 through 1799. She was the only Kirk enumerated. In 1799, her name was followed by the notation "Rich Lands" and she was enumerated with 2 horses. Was Sarah the widow of Joseph or John? Without a probate record, I don't know. 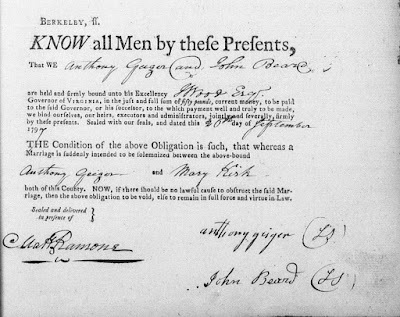 Berkeley County probate materials are digitized on FamilySearch, but are frustratingly only viewable from a designated library or research center. In a recent blog, Amie Bowser Tennant, wrote about using the reverse genealogy approach to break through genealogical brick walls: instead of tracing your ancestors backwards to a brick wall, develop a theory, identify a person of interest, and work their tree forward in time to see if it meets your known pedigree. Collectively, the DNA, land, and tax records have provided me a cast of characters with the right surname, in the right place, at the right time, and teed me up for a strong reverse genealogy case study. Since they were the only Kirks recorded in Berkeley County's paper trail, Joseph, John, and Sarah are prime research targets. It's eyebrow-raising that Joseph Kirk was deceased before the 1797 nuptials of Mary Kirk. Was he her father and his absence from the marriage bond was because he was dead? John Kirk's disappearance from the tax lists means we can't rule out that he also pre-deceased the 1797 marriage. Maybe he was Mary's father. Or maybe her uncle, and his passing meant that the bondsman role fell to John Beard. Or maybe he was the John Kirk that appeared with Thomas Kirk in the 1799 Brooke County tax list. If that's the case where was he between 1786 and 1799? I need a probate package for Joseph, John, or Sarah to help me piece together the family relationships. Do you see what I mean? Answers are within reach. I feel strongly that I'm almost through. Just one more whack and I may finally crack the Kirk family mystery wide open. I'm salivating at the thought of finding an estate settlement that names the heirs of Joseph or John. Could they include a daughter Mary and maybe just maybe a son, Thomas Kirk? It definitely looks like you are on to something here. I'd be hightailing it over to my nearest family history center.Hope you find Thomas among the heirs of one of these men. Your research is just so impressive, Michael. I have never delved into either tax or land records, but you make me think I should. Of course, my US ancestors do not go back that far, and thus I have been able to trace back to the first arrivals from Europe on both sides. My brick walls are thus in Europe, and finding those records has proved extremely difficult. Thank you, Amy! If it wasn't the challenge of tracing my lines in early Colonial America, it would be something else. Although, I will say that I loved researching my Italian lines across the pond. But you're right: it's a whole other ball of wax! Are there Order Books online for Berkeley County? 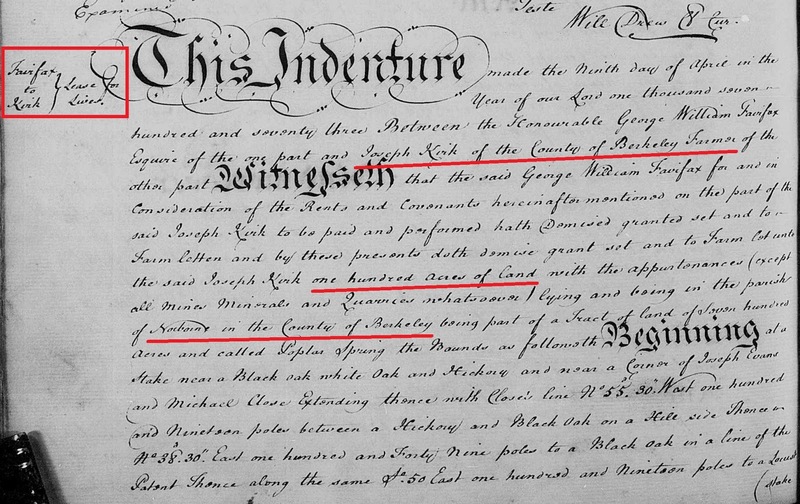 I found an entry for the release of payment of county and parish levies for my James Sims in 1845. A few pages later, his son was applying for letters of administration on the estate of same James in 1846. An interesting annotation in the margin (which I only now realized what it meant) shows there were more things going on in later years. The estate was not settled until 1855. They were only short one-liners but they led to more. Michael, I hope you have another brick wall ancestor waiting on the sidelines. When you crack this one we'll be waiting for the next. Thanks for the Order Books recommendation, Cathy. Some do survive and are digitized. 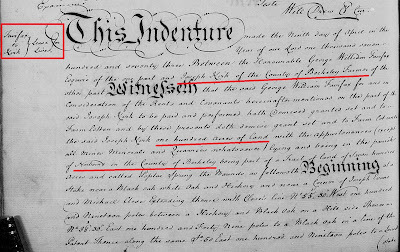 I'm working through them now (the penmanship is atrocious and I just may go blind), but I did already find an interesting entry for the Kirks (not the linchpin that will answer my brick wall question, but definitely adds more context to the Berkeley County story). And, when I do surmount this brick wall, I'll be looking forward to the next! You're welcome. At least you found something. I took a quick peek at the index of one book and noticed lots of Kirkpatrick. Not wanting to put more research on your plate, but could your Kirks have shortened the name? Interestingly, my discoveries yesterday were in the index but not under the K's. I've discovered the index didn't cross reference parties, so I will have to eyeball every single page of the index, and for good measure the Order Books (a weekend activity with lots of caffeine for sure!). I don't think the Kirkpatricks are our kin, but anything certainly is possible. 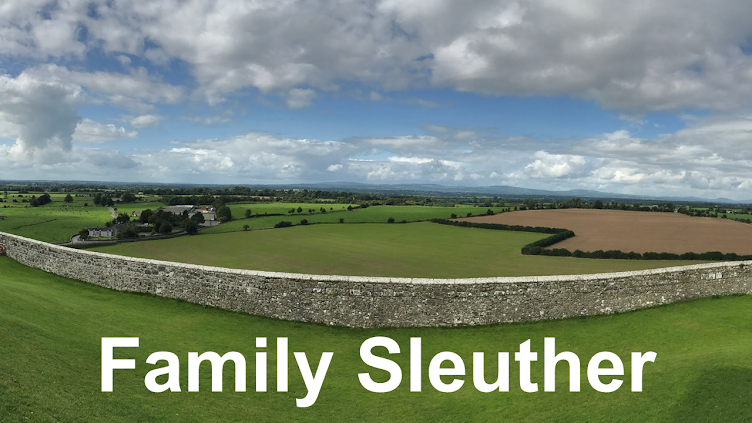 Y-DNA says the surname was originally Quirk and from southern Ireland (based on the Y haplogroup) and a very close genetic match to a Quirk with a solid genealogy back to Cashel in County Tipperary. Family lore supports the DNA with a story that the surname was changed when the family went to Scotland from Ireland (likely Anglicized from Quirk to Kirk) before heading to the Americas. Thanks for the well wishes, Dara. Fingers crossed!